we work with patients of all ages and backgrounds to provide physical and mental health care. September is Teen Suicide Prevention Month in Arizona and in conjunction with awareness events such as National Suicide Prevention Week and World Suicide Prevention Day, we want to help families, parents, school officials, students and youth to be aware of their own mental health and emotional well-being, and that of their loved ones. Students and young adults who have shared that they have emotional distress and suicidal thoughts often identify feelings of having too much pressure or of being isolated. Every problem has a solution. Please know there is hope, and there is help. What can you do if the person is a friend? If you think someone you know is at immediate risk of suicide, you need to ACT. Ask your friend if they are considering suicide or if they have a plan to end their life. It’s okay to be direct, just try to be non-judgmental and show you care. If you think someone is in immediate danger, stay with them and offer to go with them to find help. Even if it doesn’t make sense to you, try your best to sympathize and offer support. Try not to leave someone with suicidal thoughts alone. Tell a trusted adult what’s going on. Your friend might ask you not to tell anyone, but you should never keep talk of suicide a secret. It is worth breaking trust to save a life. You should never try to handle the situation by yourself. The most helpful thing you can do is guide your friend to someone with training. Seek help by calling 911 or the Crisis Response Network at 1-800-631-1314. From the start, moms and dads can form and foster a sense of worth in their child. One simple, effective way, costs nothing and reaps myriad rewards: Tell your child you love them, every day. Make sure they know there’s nothing they could do to lose your love and reinforce it with frequent hugs and words that build up and don’t tear down. Tell your children that you are proud of them. Avoid making them feel like a burden. These simple acts can help mitigate the risks for suicide. Remove access to means. 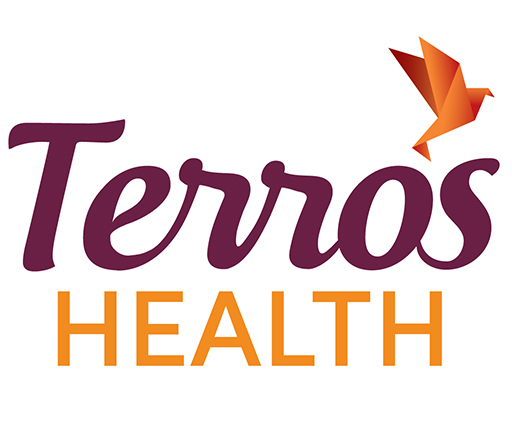 This includes guns, knives, ropes and belts, and prescription drugs and over-the-counter medication. Seek professional help and evaluation. If you have private insurance, obtain a list of credentialed counselors in your area, and call for an appointment. What can you do for a student? For teachers, when you observe changes in a student’s behavior, pay attention. If the changes concern you, talk with the student if you’re comfortable doing so. Feel free to consult your school’s resources staff about your observations. Follow your school’s protocol for helping a student in distress. Your role in youth suicide prevention is critical—staff who have been educated and have an awareness of youth suicide are a school’s greatest prevention resource! There are great resources and training for educators at https://www.sptsusa.org/educators/. If you are seeking ways to help students that appear to be struggling with behavioral health issues, you can access tips and further assistance at http://www.mentalhealthamerica.net/conditions/tips-teachers-ways-help-students-who-struggle-emotions-or-behavior. Where can I access local training in suicide prevention? 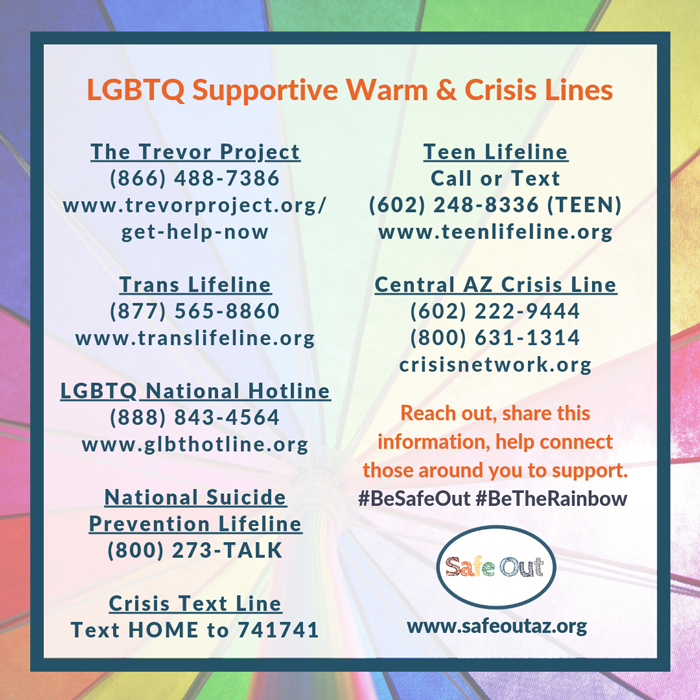 The Safe Out LGBTQ Youth Coalition in Arizona provides safeTALK Suicide Prevention Training, available free and open to the public on a quarterly basis. Through this training, folks learn how recognize the signs of suicide and how to connect those struggling with help. No previous mental health experience or training is required. To learn more about the availability of the next training, contact Isaac Akapnitis at 602-685-6082.